Hello mommies! I presume some of you are so ready for Christmas. Prolly you have already displayed your gifts under the Christmas Tree. Yours truly is still busy as a bee and can't squeeze in time to do some Christmas shopping. Let Jollibee brighten up your day! Hear him talk and see him blush with every hug. Get your Jollibee Talk and Blush Doll for only P420 for every Jollibee Value Meal. Proceeds of this project will support the activities of the Jollibee Group Foundation. Perfect gift for kids this Christmas. Last year ata yung dancing jollibee, now eto naman. Kudos to their marketing team. Hi, available pa po ba yung Jollibee Talk & Blush Doll? Available until January 31 or until supplies last. Hi goodeve ask ko lang if what type of AA Batteries ang kailangan para gumana yung jollibee doll alkaline lang ba ang pwede?. Bumili kasi hubby ko last saturday ng jollibee doll for our daughter pero nung after na namin lagyang ng 3 pcs ng AA Bateries ayaw pa din gumana nung jollibee doll. Yes, double A (AA) yung size. I'm using naman the regular battery, not alkaline if my memory serves me right. The doll kasi is not with me na so I can't check. It's available until January 31 but some stores ran out of stock na. Kindly check na lang with their customer rep. Thanks! I'm not sure if the doll is still available up to know. Usually all branches of Jollibee they have naman kaya lang minsan ubos agad yung stocks nila. Hello. where can I get one? please let me know. thanks. I'm not sure if this is still available. You may ask the nearest Jollibee naman. Thanks! Need to know po if san store available ung jollibee talk and blush. Rizal area po. Need to buy new one. Thanks for the help. I don't have an idea where available sa Rizal area. As far as I know, last January 31 lang available ito. If you really want to have the doll, kindly call na lang Jollibee. I saw one pala sa Shopwise Jollibee, Commonwealth on display but not sure if they're selling it pa. Able to buy in Jollibee Las Pinas... you just need to ask, it's not being displayed anymore. Thank you so much for sharing your experience. Hope those who are looking for this doll may find one soon. Saan po sa laspinas yan? Hope he/she will give leads. Thanks! is Jollibee talk and blush available. need to purchase one for my upcoming 2 yrs old grandaughter on. feb. 26. 2017. hope you can help me to acquire one. She keeps on talking about Jollibee. Some said there are still displays on select branches. Kindly visit them na lang or you may call Jollibee's customer service. This is beyond my control na po. Sorry to hear that, it's for a limited time only lang kasi. I missed buying this. I'll take my chance by asking them if they still have remaining stocks even though the promo is past the due date. Hope you can find one. Just ask the SA (sales attendant), who knows there's a stock inside their storage room. Good luck! I'm not sure po. Usually limited time lang talaga yung mga dolls. Baka po sa December na ulit. Pasensya na po. Thank you! I think sa December na ulit magkakaron. Kindly visit na lang sa mga Jollibee stores to check if meron pa sila. Thanks! I still have no idea po. Hi po. Ask ko lang po if saan ako makakabili ng Jollibee stuff toy. My son is so happy kapag nakikita nya si Jollibee. Last night we attended a birthday party held in Jollibee Angeles City and its just so happened na merong mascot and luckily si Jollibee. I couldn't explain how happy my son is. So i need help to find where to buy Jollibee stuff toy for my young little man. Thank you so much in advance. Available po pa ba ito? saan pa po ba makakabili ng Jollibee Stuff toy? Salamat. I have no idea if magiging available pa ulit ito. Walang anuman. 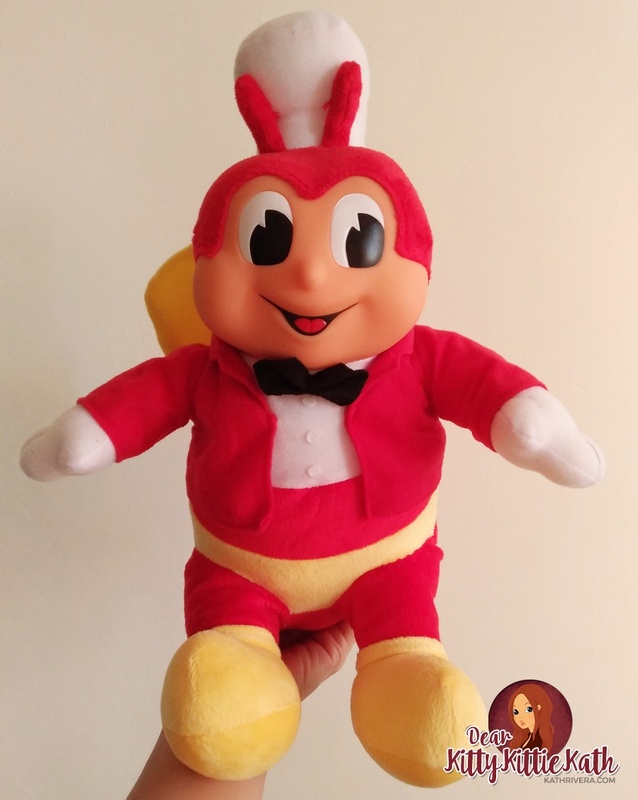 Hi po ask lng po kng meron na po kayo ngaung december ng jollibee stuffed toy? I don't sell po Jollibee Stuffed Toy. Kindly visit na lang po yung mga branches if meron this year. Thanks!